1- Glass pastes and ceramic glazes as used in Egypt since the fifth millennium BC. These are the two materials more akin to enamel proper. In reality, the goldsmiths originally set glass-made gemstones directly in the metal. 2- Egyptian blue, also known in Italian as “smaltino”, invented about 2000 BC as a cobalt-based pigment with an addition of potash, applied as paint for decorative purposes. 3- Niello, consisting of the application of a black fusible powder on engraved metal. The technologies and the application method of niello are very similar to enamel. Invented in Egypt, the technique was already widespread in the Mediterranean Sea at the start of the Iron Age. On the left: Glass paste, Egypt, 5th millennium BC. On the right: Tellus ring, 3rd millennium BC, gemstone inlay. Then, c. 1500 BC, in the Mycenaean civilization, the goldsmith and the glassmaker invented a glass similar to gemstones that could melt on the gold, adhering and forming a permanent bond on the metal surface through a vitrification process at high temperature (source: A. H. Dietzel, Emaillierung, Springer-Verlag, 1981). The earliest enamels found in Mycenae and dated to 1425 BC were exclusively blue: since this moment, it is possible to study the history of enamelling through the archaeological findings with greater certainty. You should take notice, anyway, that the technique originally had, for a few centuries, a use restricted to jewels and religious objects, which makes it even more difficult to outline a full history of enamel art. On the left: bronze daggers decorated with noble metal. On the right: a partially-enamelled cloisonné dagger, Mycene, 14th century BC, Athens Museum. The most ancient findings of true enamel come from Cyprus during its golden age, at a time when the Mycenaean people found refuge on the island after the Achaean invasion. The high quality of the objects from this period show a deep knowledge of the technique, despite the rarity of the findings. The first known examples are the six golden rings dated to the 13th century BC, found in a tomb in Kouklia. Another noteworthy object is the 11th century BC Golden Royal Sceptre of Kourion, found in the ancient capital city of the island, whose round knot mounted on a 16 cm staff bearing decorations with white, lily and green enamels in little cells formed with a technique later known as “cloisonné” in French. Both the Sceptre and the Golden Rings are now in the Museum of Cyprus in Nicosia. 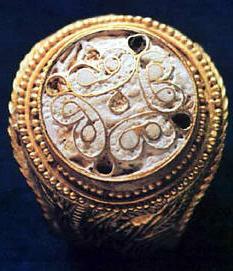 One of the six golden rings of Kouklia, Cyprus island, 13th century BC. Knot of the Golden Royal Scepter of Kourion, Cyprus island, c. 1100 BC. It is a subject of debate whether Ancient Egypt knew the art of enamelling in the late 18th dynasty period (1543-1292). On this issue, this is what famous Egyptologist T.G.H. James wrote about the necklace of the goddess Nekhbet on the pectoral of Tutankhamun (1332-1323 BC): “In many of the pieces of jewellery from Tutankhamun’s tomb a cloisonné technique with glass inlays has been observed. True cloisonné enamelling consists in filling the cloisons with powdered glass which is then fired in position, this results in inlays which completely fill, and are closely fixed in, their little gold enclosures. It has yet to be confirmed by close scientific examination that the technique was used in this case." It is thus unsure whether we may say that these Egyptian findings were true enamel or not, at least before the Hellenistic age. Nevertheless, we should keep in mind that in the days of Tutankhamun Egypt had been entertaining economic exchanges with Cyprus since at least 50 years earlier in the form of importations from the so-called Peoples of the Sea, which may justify the presence of enamelling during the New Kingdom – once again originally from Cyprus.